1. 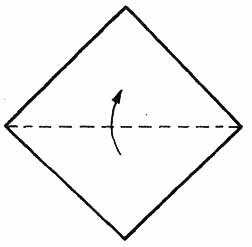 Take a square sheet of paper and fold it diagonally. 2. Fold the workpiece “valley” in half. 3. Open “mountain” a pocket and flatten out. 5.Scroll to the right top layer of paper. 6. Open and flatten out another pocket. 7. Fold “valley” lateral sides. 9. Open the top pocket, carrying out all specified folds. 11. Mark the two side folds. 12. Open a pocket, repeating all folds from point №9. 13. The basic form “bird”.